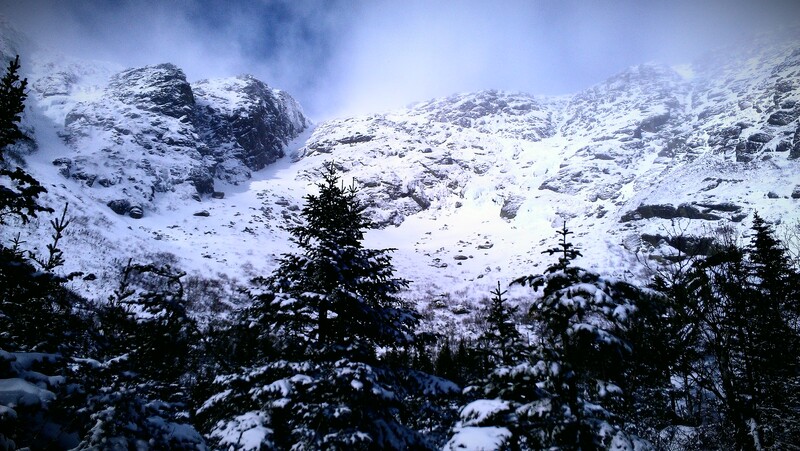 Mount Washington via Huntington Ravine (North Gully), Part I – Jet. Set. Jeanne! ‘You haven’t experienced misery until you’ve experienced the mountains.’ That being said, I did just undergo a wisdom tooth extraction, porcelain composite, and composite cavity restoration in one sitting, and that was pretty miserable, too. The day started off beautifully: we were blessed with bright, blue, sunny skies, minimal wind on the approach, and summit temperatures of a (relatively) balmy 6F as of 6:27am on the 4th of February. Admittedly, I hadn’t realized that I had just signed up for ‘the most exposed and intimidating hiking path in the White Mountains‘ until about 16 hours prior to our summit attempt. ‘Add a little bit of snow and making your way through the Ravine automatically becomes a full-blown mountaineering challenge.‘ Oops. Fortunately, my previous mountaineering experiences (Mt. Washington summit, 12/31/10; Mt. Kenya summit, 1/19/11, Mt. Mansfield summit, 2/26/11, Mt. Whitney summit attempt, 10/8/11) had armed me with just that – a bit of experience, albeit limited. I knew the importance of pacing, hydrating, wearing as few layers as possible at the start to prevent overheating, making as many adjustments prior to the slog, and taking as few breaks as possible to maintain efficiency. Unfortunately, there was one adjustment that I had failed to double check – an oversight that I would later regret. The Huntington Ravine winter trail begins straightforward enough, leaving from Pinkham Notch on the Tuckerman Ravine Trail for 1.7 miles before hitting the base of the 800′ headwall. Our team of three (Greg, Slawek, and myself) stopped to refuel, dry off, and warm up at Harvard Cabin before continuing the trek to the base of the headwall. We had been making good time, arriving at the cabin in just over an hour. From the headwall is where the real fun begins. The trail then ascends steep slabs and ledges to the climber’s right of the prominent feature known as Central Gully. Throw in a few feet of snow, some wind, and subzero temperatures, and voilà – instant mountaineering conditions.